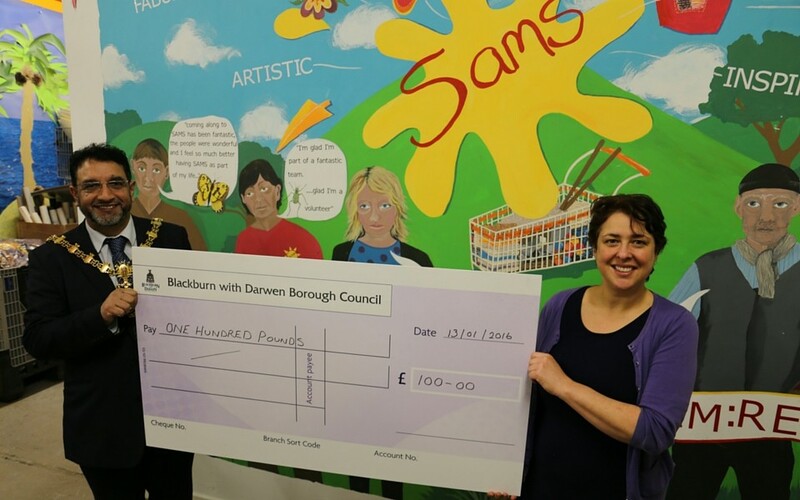 The Mayor of Blackburn with Darwen, Councillor Faryad Hussain, made a personal donation to the charity@SAMS – which stands for Scrap Metal Art Store. He made the donation after being moved by efforts of a fundraising event held at Witton Park last month. It had been organised to raise money for the Christmas Wishes Appeal in conjunction with the Council’s Connect team, to promote active and sustainable travel in the borough. The Mayor, who began his mayoral year in May, presented the donation which is to be split between the organisation’s Easter Challenge and the 2016 Christmas Wishes Appeal. I wanted to make a contribution to the charity after seeing first-hand the good work that goes on to support local families. I feel humbled and proud of the work that is being done via SAMS to distribute Christmas presents and Easter eggs to those in need to help bring a smile to the faces of underprivileged children in our local area. The community interest company collects surplus supplies from local businesses and resells for a minimal charge to nurseries, schools, faith, community and craft groups as well as individuals. Everything from wool to wallpaper are collected directly from the supplier and rather than being sent to landfill they are reused in educational and creative activities. SAMS operates as a not-for-profit social enterprise where public and private organisations are welcome. It aims to raise awareness and encourage recycling within the local and business community reducing landfill and disposal costs whilst helping local children get crafty. We were thrilled to receive this personal donation from the Mayor and were pleased to be able to show him round our warehouse. We raise funds and collect gifts all year round to provide presents at Christmas and Easter. Donations may go to a child living in care, a young person living in a hostel or a homeless person who has dropped into a day centre on Christmas Day, it all makes a massive difference. If you are an organisation and wish to donate funds or gifts for the Easter or Christmas Appeals please phone Sarah De Nurtcheylo at Charities@SAMS on 01254 291278.